LAS VEGAS – Floyd Mayweather is known to turn a phrase and has described himself as "greatest of all-time," "pound-for-pound king," and "ultimate entertainer." A case could be made for the first two self-given monikers after his dominant win over Robert Guerrero at the MGM Grand Garden Arena on Saturday, but the third was proven an utter fallacy. Ultimate entertainment this was not, due to both Mayweather's total dominance and his defense-oriented gameplan. Toward the end of the fight boos could be heard from the crowd, yells of "boring" raining down from different sections of the arena. By the midway point of the final round, many had voted with their feet, making their way up to the exits with their backs turned to the ring. 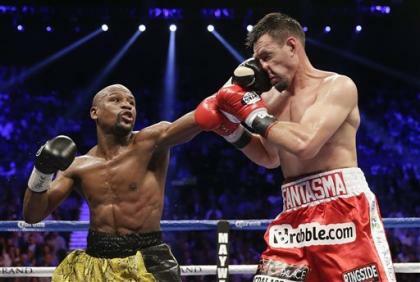 While Mayweather had too much class for a game but overmatched Guerrero, the lack of drama and absence of a knockout was not enough to appease some, who'd clearly hoped for more thrills and spills in exchange for tickets priced in the high hundreds or low thousands. "All I want to do is give the fans exciting fights," Mayweather said. "I feel bad I didn't give the fans the knockout. I was looking for it." The boos were somewhat harsh, whatever way you look at it. Yahoo! 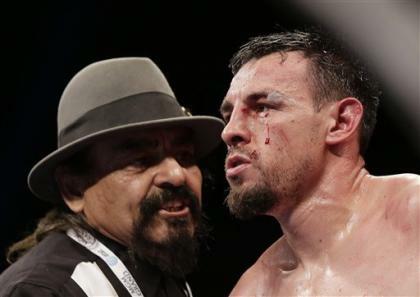 Sports scored the bout 119-109, giving Guerrero just a single round, while the judges ruled the contest 117-111. It was a mauling, a blowout and deconstruction of a four-weight world champion. It is not Mayweather's fault that he doesn't have the kind of current opposition who may bring out the best in him; though that has to be qualified by the reality that he wields executive and supreme power over his choice of opponents and cherry-picks contenders he feels will pose no threat. Similarly, it is hard to fault a man who prioritizes his personal safety. With five fights now left in his contract, and likely his career, his legacy will partly be shaped by his performances in the bouts that follow. A perception that his fights are boring could certainly harm the fondness with which he is remembered in the fight game, if not his place on the all-time rankings. Boxing needs showmanship and electric performances more than ever, and the public audience may start to feel that the flamboyance and flashiness should extend further than the obligatory all-access shows and into the ring. Changing his fight style would not only be a shift in tactics for Mayweather, it would represent a fundamental shift in his boxing philosophy. With foot speed that enables him to skip out of the way of most punches thrown at him, he may be hard-pressed to convince himself to stand in the pocket and willingly receive punishment merely to please the audience. "The less you get hit in the sport, the longer you last," he said. "We've got five more to go. Let's do it." Another night, another fight, another routine victory for Floyd Mayweather. But with the commitment of a $200 million Showtime deal, this contest, and the crowd's reaction to it, will give him some food for thought.